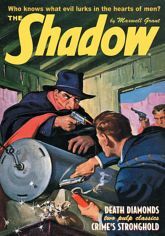 First, The Shadow investigates simian burglaries and battles a Super Gorilla when he invades "Crime's Stronghold." Then, only The Shadow knows why jewel robbers ignore diamonds and only purloin other gemstones in the novel that introduces future agent Chance LeBrue! This thrilling collector's special showcases the classic color pulp covers by George Rozen, the original interior illustrations by Paul Orban, and historical commentary by Will Murray. Softcover. 112 Pages. Black & White. 7" x 10"